The bandits came in the night, wielding batons and hatred for the Benadir. Apartment by apartment, they slaughtered the males. Many died in the Battle of Mogadishu this October night in 1993. The terrorists killed Mukhtaar’s father, leaving Mukhtaar for dead, but towards daylight, he breathed a shallow breath. Halgan, his mother, and Samiira, his fourth wife, watched over him in turns, but never together. When Mukhtaar regained consciousness three days later, he could not make his right side work. They packed bundles on their backs and shuffled through the ruined streets. Abshir, first son of first wife, heaved his father onto a stretcher and dragged him along a trail already worn smooth by thousands of refugees. Halgan carried as little as possible, leaving the biggest bundles for Samiira, who also carried Deqo, her two-year-old, who cried or slept nestled against her mother’s breast. They trudged across Somalia in the company of other Benadir, the urbanized merchants and artisans targeted by armed forces in a failed state. They walked away from the Indian Ocean, towards Mombasa, Kenya and the Swaleh Nguru refugee camp. They had become nomads, although their ethnic group, prior to the wars, had been the least mobile and most prosperous of all Somalis. Once across the border, the family struggled to make some living, waiting. Returning home was not an option, so they applied for refuge in the United Sates. Mukhtaar could do little to support his family. Abshir worked at any small jobs he could find. Their tent sheltered and enclosed them in frustration, bickering, and sadness. Nafiso was born, and then Sagal. Although Samiira’s three children were girls, Mukhtaar kept her as his wife. The girls, especially Deqo, became thin and frail. Malnourished, her growth slowed. In 1997, the family climbed aboard a plane and flew to Richmond, Virginia. Hayaan, claimed as Mukhtaar’s second son, joined them, making a family of eight. They arrived in January to a cold they had never known in Africa. Coats and artificial heating were strange adjustments – but they had a house now, with heat and running water. Why Richmond? A refugee family must go where sponsors are willing to commit time to the family’s acclimation. This family’s sponsors were The Catholic Refugee Services and a church. Why me? I wasn’t a member of the church, nor an employee of The Catholic Refugee Services. My motives were not entirely altruistic. As a professor at Virginia Commonwealth University, I had been approached to write a grant for federal funds to teach English as a Second Language methods to teachers overwhelmed by the many refugee children flooding their schools. Apparently I wrote a good proposal because we received a sizeable grant. And then I had to scramble. What did I really know besides theory? I volunteered to help this family so I could practice teaching English language learners. That “practice” lasted for three years. Samiira, Halgan, and I met almost every Friday. I designed a kit of everyday tools: ice cube trays for letter sorting, a tray I filled with salt for kinesthetic tracing of letters, pictures from grocery ads. When the children arrived from school, I helped them too. One Friday, Nafiso tattled that Hayaan had been to the principal’s office. He had been stopping younger girls in the hallways and commanding them to carry his backpack. He didn’t understand why he should be in trouble for that. In his culture, the male dominated the females. So, I gave my first lesson on equality of the sexes! The family moved to Fargo, North Dakota in 1999 to be near the many Somalis who settled in that cold city filled with warm sponsors. Samiira became the breadwinner, as Mukhtaar became less able to find a job. Deqo, Nafiso and Sagal have grown up and have their own children now. In late October of 2016, a refugee family from Ethiopia flew into Richmond. This time, I volunteered without any ulterior motives. I didn’t realize I would be more than a tutor; I would be the entire support team for this family. The Gobana family had escaped right after the 2010 elections for prime minister. Meles Zenami Asres intended to “win” a second term. Suspecting improprieties at the poll, Dadafo’s neighbors requested that he certify that the ballot count was correct. On the way home from that duty, he was shot and assumed dead. Fortunately, Dadafo lived to seek treatment for a festering bullet wound in his knee. After two operations, an uncle sneaked him into Kenya, then drove back to collect Medina (wife), son Abdi, and daughter Biftu across the border. Fortunately, this family arrived in the United States before entry for refugees and immigrants slowed to almost a full stop. Church World Services (CWS) settled the family in an apartment and provided starter supplies. By the end of December, I had tutored 26 hours, two to three hours per week: basic conversational skills and U.S. customs. The Gobana family joined ours for Thanksgiving dinner, eating turkey for the first time. Biftu became ill. Hot and listless, she needed a doctor. My husband took the family to two urgent care facilities before finding a third that could accept their insurance. He spent six hours waiting as Biftu was treated. The next day, I helped Dadafo purchase prescribed medicine. The family had never dealt with a system requiring baffling forms, regulations, and medical cards. CWS helped Dadafo find a job and get the children enrolled in school. In February, Dadafo began work. Social services provided transportation to and from the workplace. He was proud to be employed, although his knee ached constantly. In March, CWS ended its services. I became a problem-solver. When SNAP benefits were reduced, I discovered that renewal forms had not been submitted. I located the caseworker, filled out appropriate forms, and submitted them on behalf of the family. Tutoring became secondary. I was now far from my comfort zone, trying to understand a social service system I had never had to use. I learned something new each time I contacted caseworkers. They were always courteous, but I had never felt so confused. I have gained understanding and respect for those who must navigate this system. Then, I discovered ReEstablish Richmond. Their mission is to help refugees become self-sufficient. They located a driving manual in Amharic. Dadafo began study for a learner’s permit . The International Rescue Committee helped with medical assistance for Dadafo’s aching knee. In May, Medina began attending a Goodwill Industries program to practice work and language skills. I helped navigate issues with daycare and transportation. In June, medical services were suspended for reasons unknown. Aman was notified his work transportation would end August 1. My church donated funds to help. After two frantic weeks, the mistake was resolved and transportation extended until the end of September. Dadafo passed the learner’s permit test after three tries. The last week of August, he received his driver’s license. The family received a car through Vehicles for Change. Abdi is a high school student. He loves school, soccer, and track. He is the main translator for his family, having learned British English in Kenyan schools. Biftu is thriving in elementary school. Medina is looking for a job. Their goal is to manage on their own without help from social services as soon as they possibly can. My goal is to help them. Their successes make our country richer. Judy Richardson lives in Richmond, Virginia. As a professor of Education, she wrote articles for academic journals as well as three textbooks. She taught courses in literacy and methods of teaching English as a Second Language. Once retired, she began writing short stories, memoir and fiction. She has published in The Penman Review, Persimmon Tree, and Lowestoft Chronicle and the book Stories Through The Ages, Baby Boomers Plus-2017. She is the recipient of the Ventura County Writers Club Award for 2017 and received second place in the Living Springs Baby Boomer story contest for 2017. 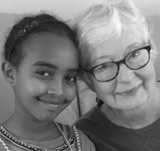 Richardson is writing a narrative non-fiction book about her experiences mentoring an Ethiopian family. View More: Next piece "Catalina, Mi Amor", Home, Archive. Thank you for taking time to comment on my story. I would like to talk with you sometime about your memories of the revolt for independence from the Serbs. Reading it, I recalled back the sadness, the pain, the trauma that is vaused by wars all over the world, but I also licatedmy memory in the war of Kosova, where back in 1999, more than a milion of ethnic Albanuans were turned refugees over the night by the serbian ocupator. The stoey is really a genuine description of the human distress and the human madness, and the wish for power over the innocent people. The work focuses on strengthening the human altruism and the wish for people of differente races to love and care fot peace and wellbeing for everybody. Bravo to the writer. Amazing job. An emotional description of global inequality and sufferings caused by unjustified wars and hatreds which have a profound impact on people’s lives. It reminds me all the pain and despair that Albanian families felt during the war in Kosovo and a natural revolt urges inside me and makes me scream that such suffering should not go unnoticed or unheard. They should be exposed until humanity understands that war creates more problems than solutions. Fortunately, there is still hope for humanity. Even in the darkest times there is light, there is hope. I feel grateful to the USA, to all the organizations and individuals who do their utmost to ease such pains and spread some happiness even in the most wounded hearts. I can’t wait to read more about this family and the chances given to them. What an inspiring story! I was not present at the time of this war but I was in Tetevo when Kosovo declared independence. I think you and I may have another story to tell!